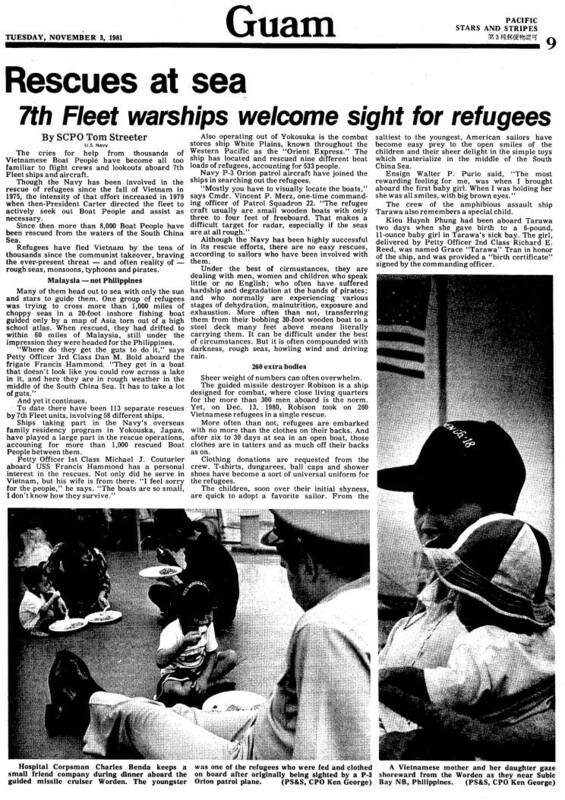 I'm looking for any information on the USS Robison's rescue of 21 Vietnamese refugees and brought to the Philippines in 1980 I believe? I am doing this on behalf of my girlfriend's parents who are very grateful for being rescued on that day. I'm looking for any pictures of the rescue efforts that might include the refugees. I greatly appreciate any help or direction you could give me. I was only able to find the below article about Robison rescuing refugees. Does anyone remember when the Robison "joined" the brown water navy? In answer to this question it was on her 1st ‘Wespac' tour of duty. I was a ‘plank owner' on the USS Robison DDG 12. There was a lot of assignments that the Robbie would be sent on that were never recorded. The Robbie on occasion, would detach herself from the seventh fleet and steam north in the Gulf of Tonkin to three islands which were involved in North Vietnam/Chinese border disputes. It was to provoke and irritate the Chinese and North Vietnamese, then listen and record their chatter. Ostensibly to “keep the area safe since. The Robbie went in so close on one of these patrols that she went in too shallow and ran up on a coral reef, with her port side foc'sle and put a 70 foot gash in her skin. The BMSN who was using the sounding line was knocked over board because of the shudder of the ship.